Apatchi was on the ground walking, unusual for him as he had wings, his wing was hurt, he needed to find a healer. But he had no luck, as he knew no healers I’m the forest. Walking he sighed as the pain once again was throbbing, he scented another animal! Lightning kept crawling forwards and saw a huge bear looking creature. He stood still, waiting for zay to follow. Ursa watched from her peripheral as she saw a tiger and a wolf reach the treeline of the clearing. "I do hope you and your friend come on friendly terms. I never take kindly to bandits or thieves." Tana was walking through the forest, her tail dragging slightly along the ground. Her nose twitched as she scented another animal though, and she looked around. 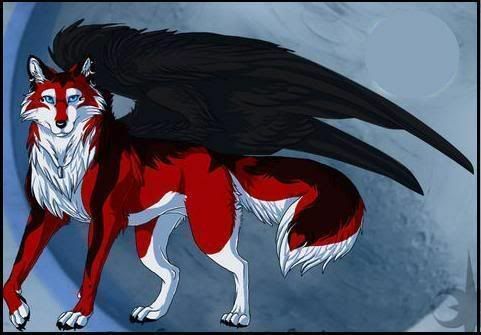 Her paws pressed soundlessly against the floor as she walked until she saw a winged fox. Her nose twitched, and she asked "Um... are you alright? Your wing doesn't... look too good." She sniffed at him a bit from where she stood, a little unsure. He looked at her, his back fur rising.” Yeah, just twisted my wing.” He said and looked at the wolf, a forest wolf, very rare nowadays. Inspecting the wolf with his eyes. Tana's nose twitched, and she offered "I can take a look at it for you if you like." It didn't take much to fix a small injury. At least it wasn't broken or missing. She took a few steps toward the fox, watching for any protest. 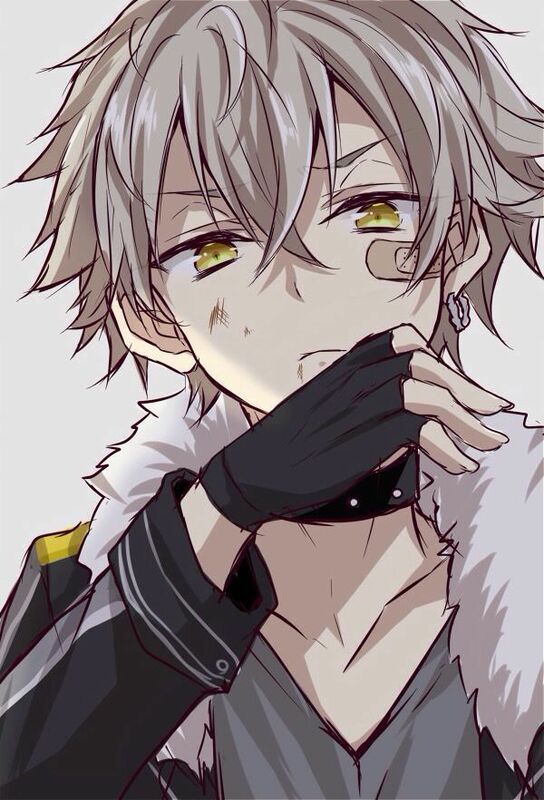 He stepped back but sat down so she could fix his wing.” Ok.” He said watching what she was doing. Zay followed behind the tiger, more warily. Although the singing was undeniably beautiful, he knew better than most that even the most beautiful things could conceal the greatest terrors. After making sure nothing was really broken or of the sort, she simply sat back, with her back to him. "Take some of the stuff from my tail. You'll feel better, and try not to use the wing for a bit." She paused. "What got you in this situation anyway?" Ursa hummed, turning to examine the two males with her soft gaze. "Why thank you, sir. Singing is a big part of my people." It was recollection of many things as well as just good on the ear. Turning away, she commented "Plus, it keeps the others here at ease, if even a little." As she finished up her snack, delicately picking out the appleseeds with the tips of two claws, she set them in a pile of other appleseeds before eating the core. "I don't believe we have met. Are you travelers?" As she waited for an answer, she moved to another section of her little camp, checking up on a rabbit who was healing from a broken hindleg. Lightning calmed down.” I’m a traveler.” He said with a nod and sat down. Scanning the camp like place he saw all the creatures. Snacks for him, but he must keep his peace, he knew this bear could be dangerous. "I suppose I am a traveler as well," Zay said after a while. "Although I don't really have a home anymore. Everyone I know passed away a while ago. They had shorter lifespans than me, like regular wolves. I had to watch as everyone grew old around me, got sick... It was horrible." he paused for a while, a shudder running through his whole body as the old, painful memories resurfaced. He shook himself, before continuing, "So here I am, I guess. Just looking for a purpose in life." “Wolves you say?” Asked lightning with a questioning look.” I saw two wolve, they are like the opposite of eachother. Nasty dogs.” Said lightning.” They were also traveling with a fox.” He added,” I’ve never seen multiple wolf creatures like that before.” He said with a nod. He is a maroon, blue-ish grey, and turquoise coloured snow leopard thing. He has lime green tufts of fur all over his body. He has massive antlers with light things on his neck and tail. He has multiple white small spots. He is wise and mysterious. Stealthy and tricks those he doesn’t trust. He can come off as very mean and a bully, but really, he’s just messing around. "I'm fine." When Apatchi told Tana of how he ended up that way, she tilted her head. "What a mean guy then. Well, at least nothing was broken." Ursa listened to them curiously. "Well, I myself will live for a while longer. We age much slower once we are adults." She looked over to the wolf, tilting her head before seeming to smile. "Nothing happens for no reason, young one. Everyone and everything has a purpose. You just have not found yours yet." Turning away from the rabbit, she moved to the pile of coals, poking at something else wrapped in leaves as she said "You must be wary here though... many creatures lurk, some that make even dragons quake." She then seemed to frown a bit, changing the subject as she asked "Are you two hungry? I have plenty of food to share." "Perhaps," Zay muttered in agreement. Though what the bear said sounded like a bunch of nonsense to his ears and seemed better suited for tales of the elderly, he could not bring himself to outright disagree with the wise-looking bear. "Thanks for the warning. I'll be more careful," he said as he proceeded to take cautious, wary steps, doing his best not to disturb the foliage around him or to make loud rustling noises. "Though what monstrosities would possibly dream of lurking around in such a peaceful looking place?" "Yes!" Zay exclaimed, his hunger still not sated from the earlier shared catch. Then realizing that he was acting a bit too much like an overeager pup, he folded his ears back and repeated. "Yes, please, if you would be so generous as to share." “Definitely.” He said his stomach grumbling and he looked around.” What kind of food?” He asked, all he saw was berries and stuff. Ursa hummed as the wolf talked to her, though she glanced over at the tiger as well. "I do have meat too." They looked like they were ones to eat it raw, so she lumbered over to another area where she kept food, rolling a few medium-sized shapes over to each male. "Horse is what I have for now. I need to go looking again." When asked what could possibly be lurking around, she went quiet for a moment. "I myself have never seen such things, but I have seen dragons, one old one in particular. I asked her if there was anything stronger than dragons, who learned to use powers first, and she said that the strongest generations have been long forgotten, hiding away or dead, though they were not dead due to old age. Something killed them." Lightning nodded and took a piece of the horse, he was a little food aggressive and snarled. He took his piece to s small opening and continued to eat it. (🌌ᔕᑭᗩᑕᗴⓄⓉⓉⒺⓇ🌌 I'll add more later!) Honal - Conalotchi - 425 moons - A spiked bright red wolf-like creature with a white chest and a partial white face, don't forget his sky blue eyes, shape-shifting powers and sharp long teeth. He has a white underbelly and tail, white some white and black on his legs and back. Shiny black feathery wings sprout from his bulky back. He has small silver earrings. Honal is quite big for a Conalotchi, but he doesn't care. His appearance never ages, so he appears young. He has some black on his ears. Honal also has a sapphire necklace he got from his mother, who died a long time ago when he was just a pup. He lost his parents when he was younger. He is quiet, powerful, and proud, and can be very patient at times. Can talk a language only Conalotchi understand, but mostly speaks in the public language. 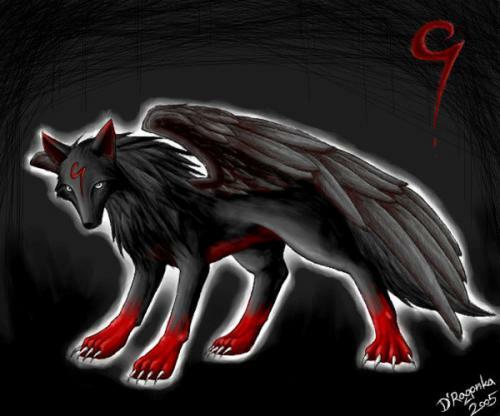 Corle - Conalotchi - Corle is a spiked pitch black wolf-like creature with small silver eyes and bright red paws. Her wings are black, tinged with red. A red hook like mark on her forehead. She has a red underbelly and a scar on her right shoulder. Corle's red paws are quite big, with long, sharp claws instead of long and sharp teeth. Her ears fade to red at the tips, and her tail fades to faint red at the base. Corle's wings are smaller than Honal's, but she manages. Corle is fierce, determined, and hot-headed, and tends to snap at the creatures that provoke her. She is fluent in the traditional Conalotchi language, but sticks to the one that all animals understand.